Utica, NY, USA – A new Munson Ribbon Blender that meets sanitary standards, blends up to 1.84 m3 of powders, pastes or slurries. The unit, model HD-3.5-7-S316, is constructed of #316 stainless steel with continuous welds having 6 mm radii polished to 150 grit, a #4 (-32 Ra) interior surface finish and external removable seals. The blender’s 2:1 length-to-diameter ratio is said to distribute ingredients uniformly during loading, blending and discharge. It forces a split double-helical agitator through stationary material, producing homogeneous blends in 5 to 6 minutes typical. 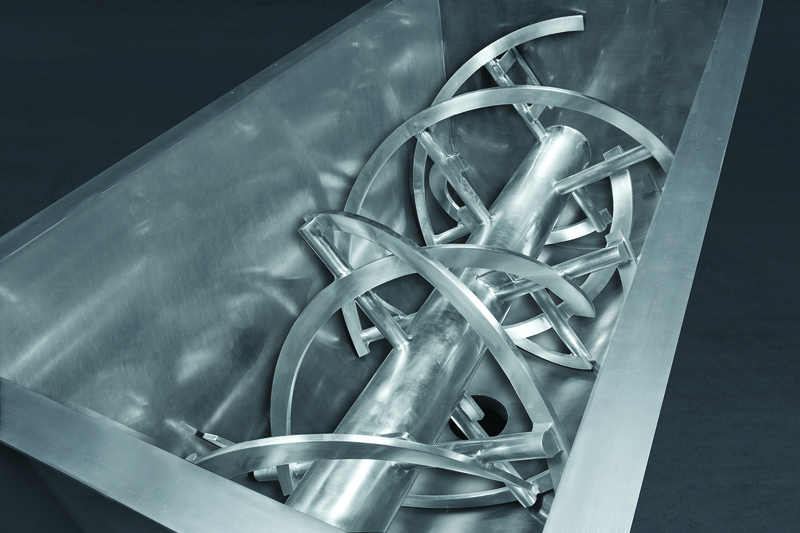 Tight tolerances of 1.6 to 0.8 mm between ribbon blades and the vessel wall minimise residual product in the trough following discharge, reducing material waste and cleaning time. It is equipped as standard with a hinged and gasketed cover with safety interlocks, and available to Pharmaceutical and USDA Dairy standards with continuous welds finished up to 240 grit and #6 or electropolished interior surface finishes. Other options include a dust hood inlet with removable grating for ease of loading, spray lines for liquid additions, multiple discharges, special drive arrangements and CIP manifolds. Available sizes range in capacity from .03 to 28 m3. Other Munson mixing and blending equipment available to sanitary standards includes Paddle Blenders, Cylindrical Plow Blenders and Rotary Batch Mixers. Size reduction equipment available to sanitary standards includes Pin Mills, Screen Classifying Cutters, High Intensity Mixers and Rotary Lump Breakers. Constructed to sanitary standards, Munson’s Ribbon Blender model HD-3.5-7-S316, allows rapid sanitising between batches, preventing cross contamination.